MOUNTAIN VIEW, Calif. (KGO) -- From foosball to pools to cool food and a fun work environment, it's easy to see how Google offices look like a playground. 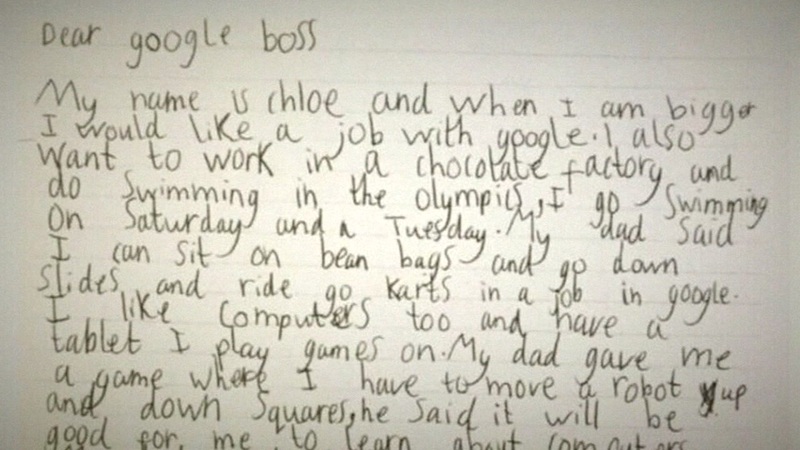 Chloe, 7, from England saw them and wrote to Google, asking for a job. She wrote, "Dear Google Boss," and spelled out her qualifications. "I am very good at my spelling and reading and my sums," her letter said. "And I like computers too and have a tablet I play games on." The sweet letter eventually made its way to Google CEO Sundear Pichai. He wrote her back saying, "If you keep working hard you can accomplish everything you set your mind to." He also wrote, "I look forward to receiving your job application when you are finished with school." Click here for more of ABC7 News' photos, stories and video on Google.